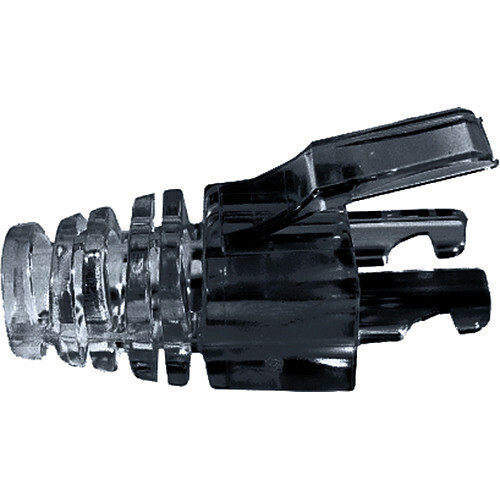 The pack of 100, black EZ-DataLock Strain Relief Locks for CAT6 Connectors from Platinum Toolshelps to protect and secure your data network 24/7. These locks are also used as a snag-proof strain relief for CAT6 cables that are not to be disconnected. They remain locked until the "Key-Holder" is unlocked. The locks are made of polycarbonate and work with Platinum Tools EZ-RJ-45 CAT6 connectors. Box Dimensions (LxWxH) 5.6 x 5.5 x 1.5"
Do these fit over existing cables ? The Platinum Tools EZ-DataLock Strain Relief Locks are not for existing cables. It would need to be attached to the cable before the RJ45 connector.